Here's another reason to be skeptical of the subscription music sector: Rhapsody, the granddaddy of on-demand web music services and a company that largely bucked the trend of giving away songs for free, is preparing to shake up its management ranks, multiple sources told The Verge. While it isn't confirmed exactly which leaders are out, sources say the company has been searching for candidates to replace John Irwin, Rhapsody's president and the executive who has led the company for the past three years. A Rhapsody spokeswoman declined to comment and Irwin did not respond to interview requests. Plenty of people will chalk up Rhapsody's troubles to an inability to compete with Spotify and Pandora, two of the fastest-growing web music services around. The space is also getting increasingly crowded. Behemoth players such as Google, Apple, and Microsofthave recently entered the streaming-music game in some form or another. The knock on Rhapsody is that it was too slow to develop interesting new mobile apps, and some critics will argue that the company's leadership was outfoxed by the idea of music giveaways. By offering free music listening, Spotify and Pandora made it cheap and easy to hear songs and that drew young music fans away from illegal file sharing. There's a seed of truth in all of the complaints about Rhapsody, but it can't be overlooked that the company toiled for 12 years — longer than anybody — to make a go of subscription music, and hasn't managed it. GeekWire reported last month that Rhapsody saw revenues of $34.7 million in the second quarter, an 8 percent decline from the same period last year. Rhapsody is privately held company, but its financial numbers could be found in the earnings report of the software maker Real Networks, which owns 45 percent of the music service. Real also reported that "Rhapsody has generated accounting losses since its inception [in 2001]. 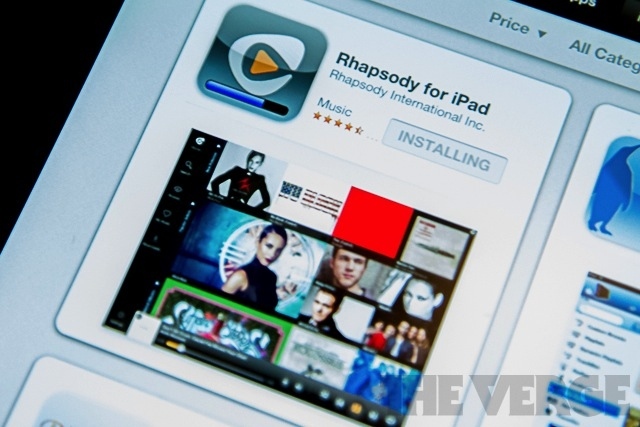 "The Verge's sources say that Rhapsody had generated profitable quarters but over the long term was unprofitable. Meanwhile, profits are also missing at Pandora and Spotify. Come to think of it, there hasn't been a single pure-play music distribution service to report a significant profit in at least eight years. Profits in this sector have become like UFOs or Bigfoot. Plenty of people say they're out there, but nobody has any proof. What there's no shortage of, however, are web-music busts: startups that were forced to shut down or were sold for peanuts. SpiralFrog, Yahoo Music, Napster, Imeem, MOG, and Playlist.com are just a few names on that list. And now comes word that Turntable.fm is in trouble. It's maybe a little early, but we might be seeing the first signs of another web-music shake out, a culling of the herd. For critics of the major labels and publishers, the lack of profits is evidence that their compensation demands are unrealistic. People like David Packman, the former CEO of eMusic who is now a venture capitalist, say that music services just can't generate enough advertising or subscription revenue to cover the high royalties. An eight-year string of profitless companies is hard to argue against. If Irwin is out at Rhapsody, he can hold his head high. He tried to build a solid business on the revolutionary idea of selling a product for more than he paid for it. Unfortunately for Rhapsody and the rest of the streaming music services out there, there's still a vast gap between "solid" and "possible."